The origin of all colour stone minerals, of every single crystal, is always a miracle of nature and tells of its origin in a time without humans. 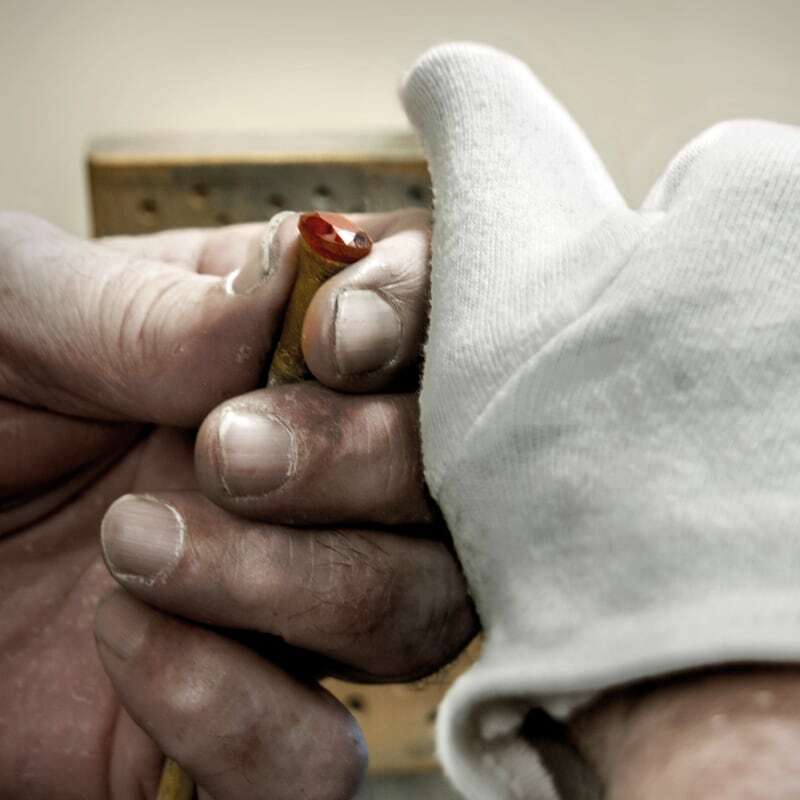 We accompany the stones with the utmost care directly from the source, the mines, through the purchase, inspection, segmenting, ebouching, cutting and polishing all the way to the end sale throughout Europe, Asia and the United States of America. With our team of more than 15 highly qualified, trained employees, we are refining what nature has created over millions of years. 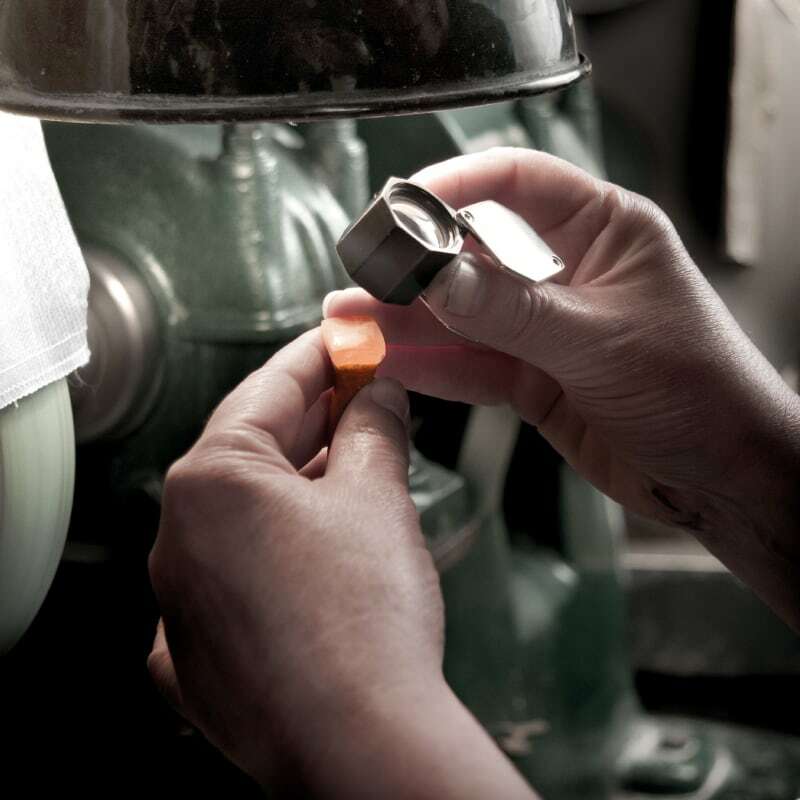 Each stone is individually inspected and carefully cut by hand to ensure optimum results. 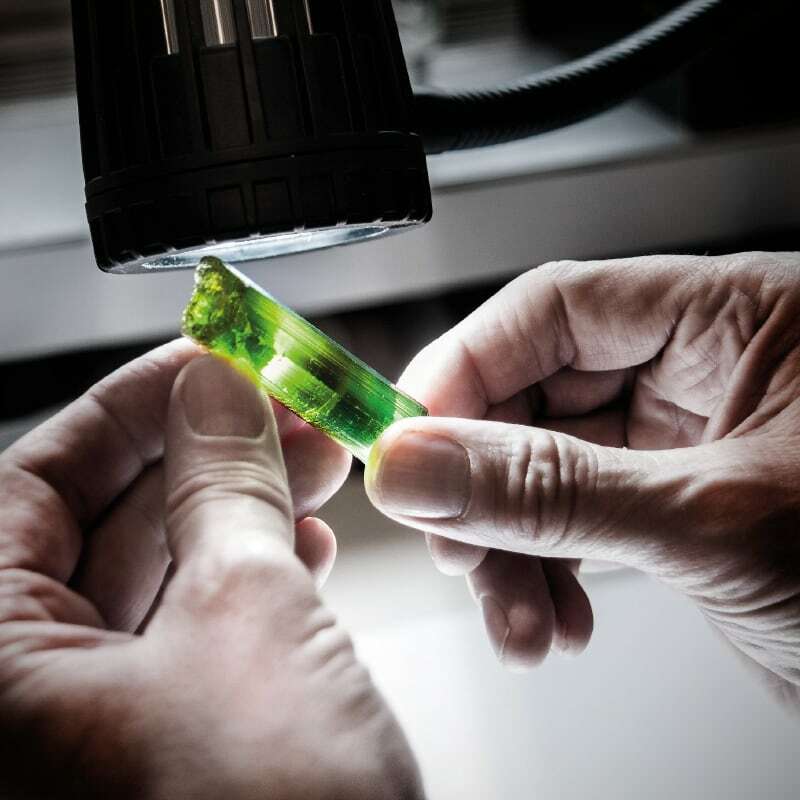 At the same time, we place particular emphasis on achieving the highest quality when manually processing gemstones and we check them through sophisticated quality controls carried out by our clerks. We get our raw stones from suppliers all over the world and we examine them, among other things, for colour, flaws, cracks and overall quality. 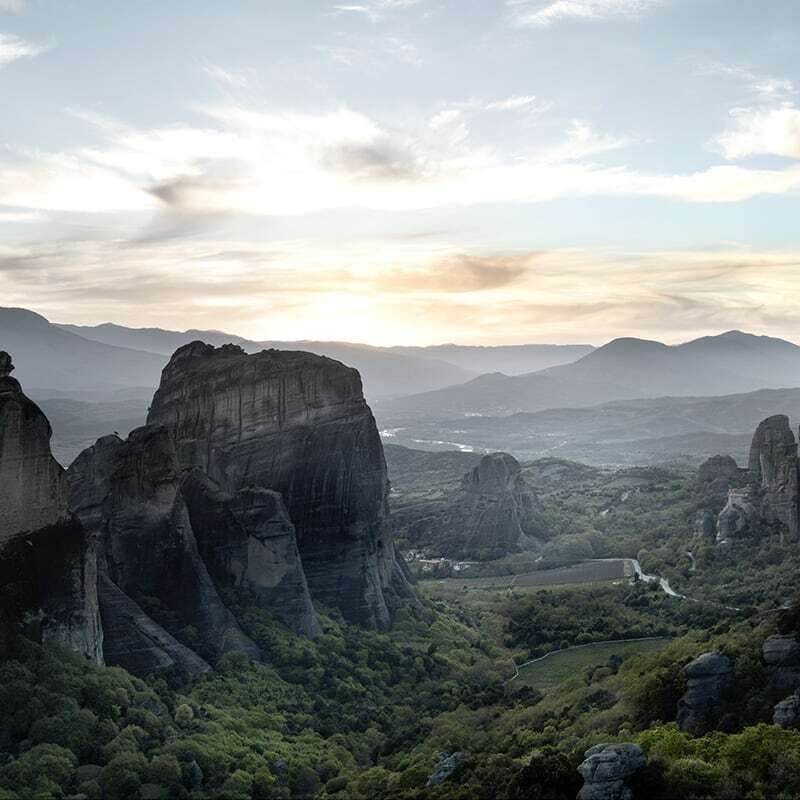 We consider what forms we could make from the stones, how much the material is worth and then we enter into a price negotiation. We pay particular attention to fair conditions for all parties involved. 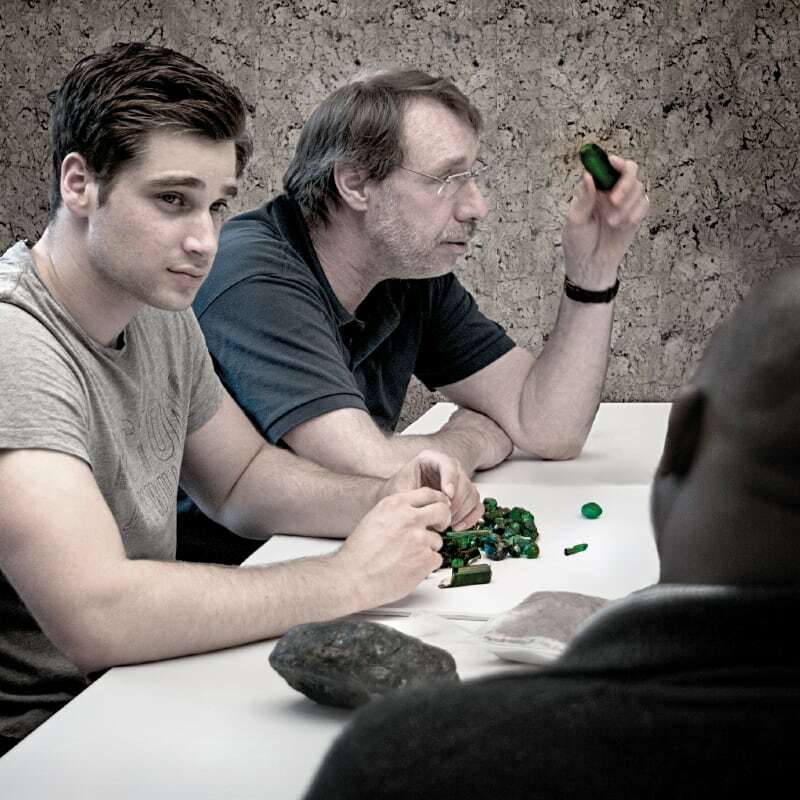 After the purchase is done, every single stone in our workshop in Idar-Oberstein is once again expertly looked at and assessed. 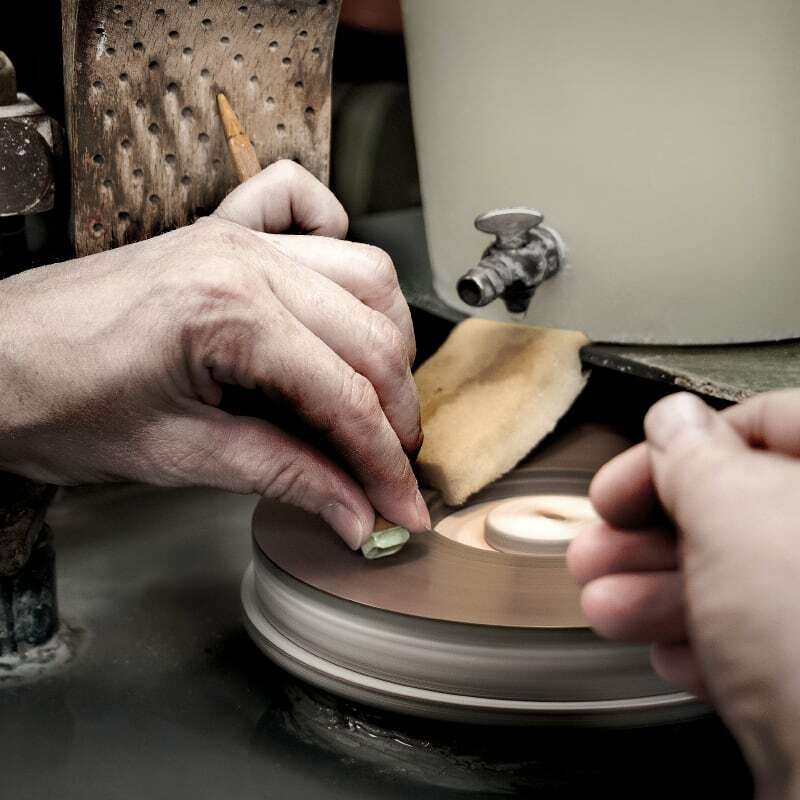 Here, the first decisions are made as to which segmenting should take place in order to extract the optimum value out of each individual stone. 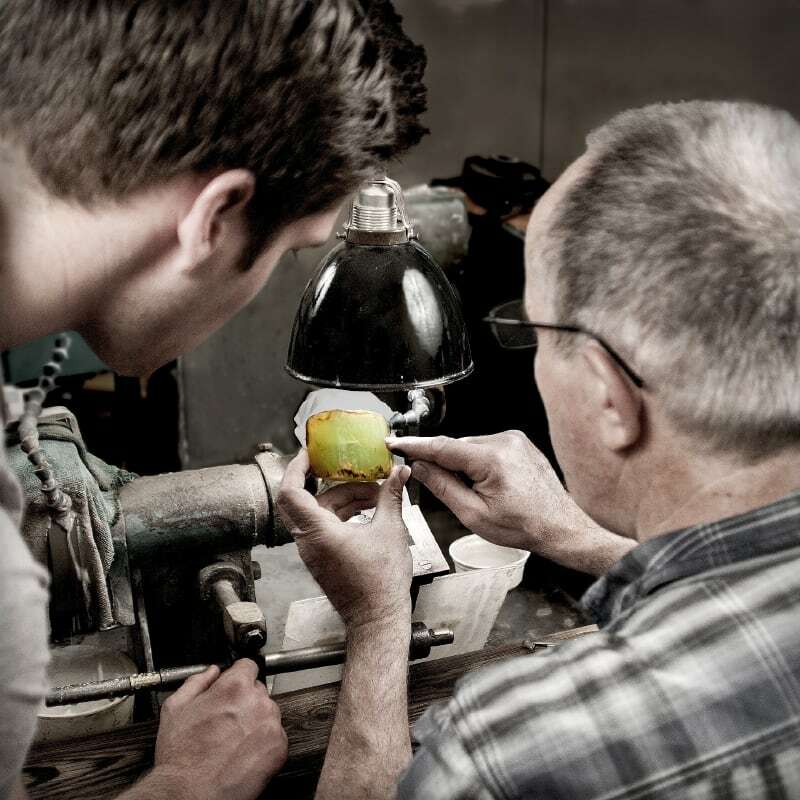 Depending on the type of stone, different axes are selected and the first cut is made with the diamond saw in order to achieve the best colour expression of the stone in the final result. 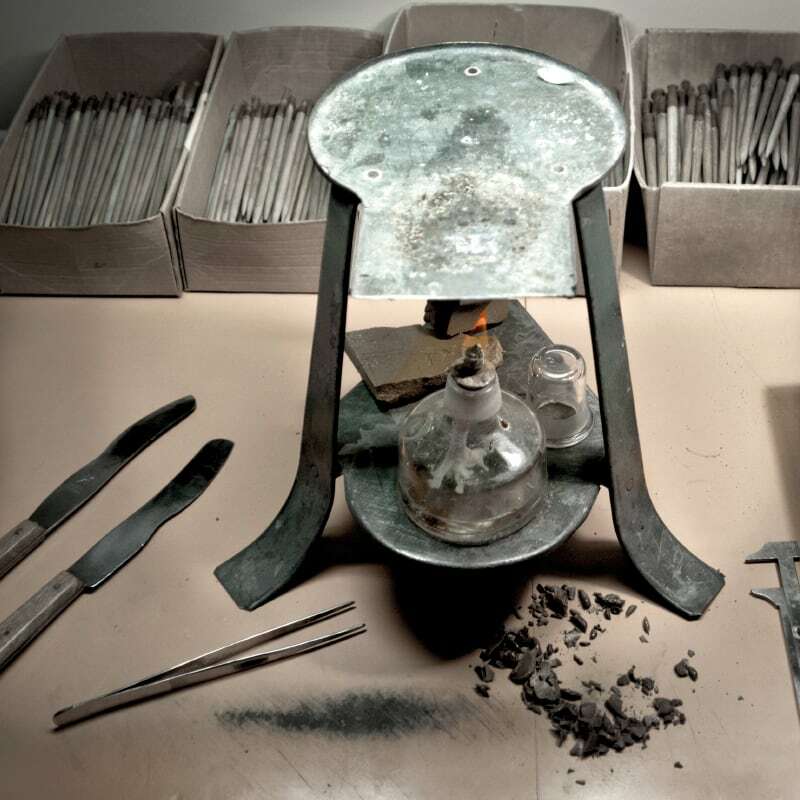 The first basic form of the stone is obtained from the gemstone refiner through ebouching. Hubert Arnoldi is in most cases personally responsible for this, since as little material as possible should be lost during ebouching. The ebouched basic form is perfected in the following steps. 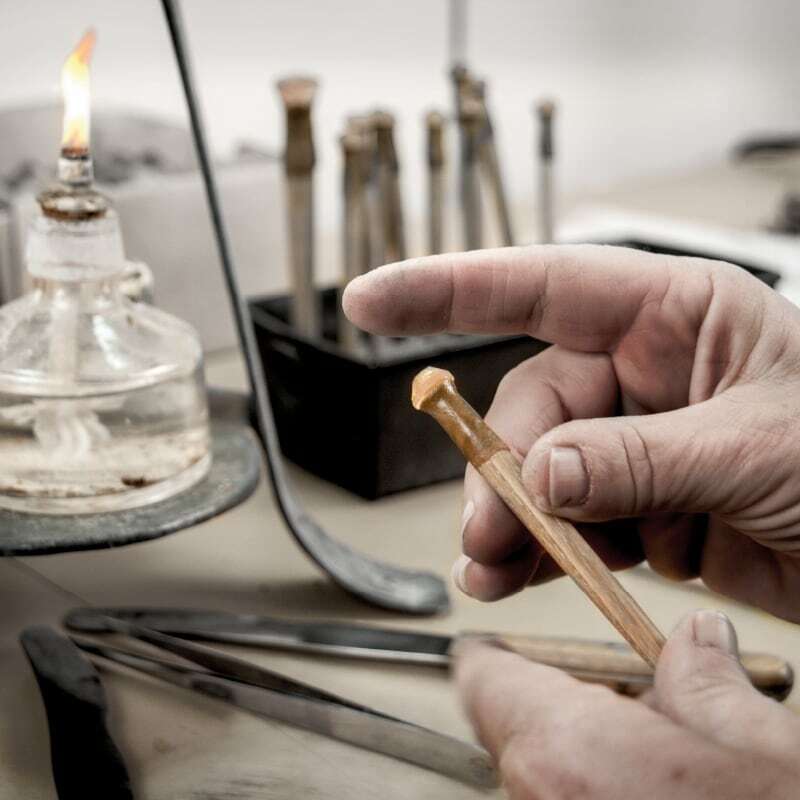 In the gemstone cutting department, the individual stones are fixed on a so-called “putty rod”. 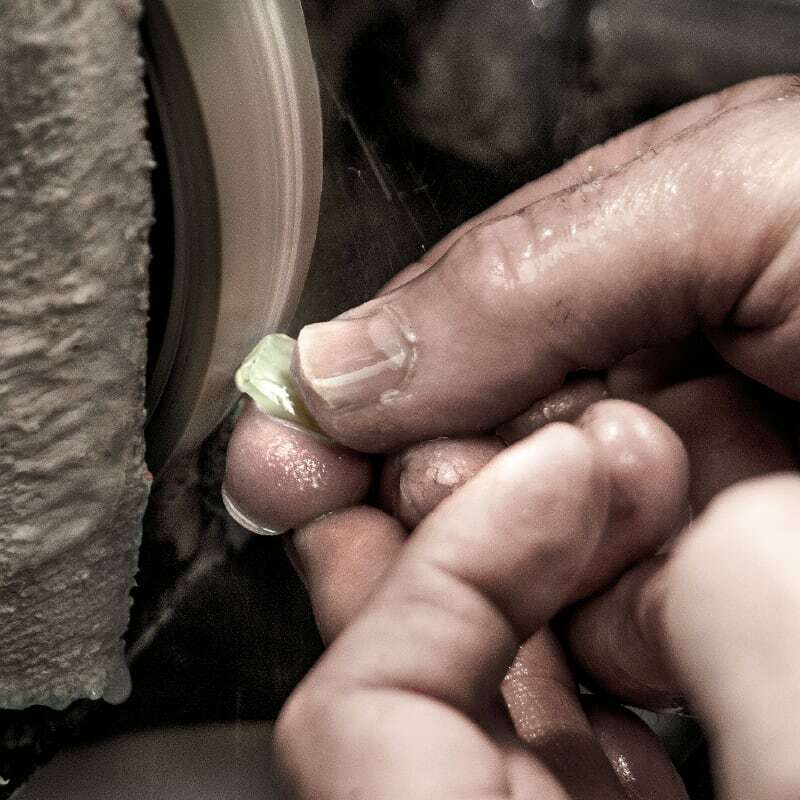 The stone can then be treated more easily in the next steps and can later be released from the putty rod without residue. The stones are re-cemented several times for the different work steps. 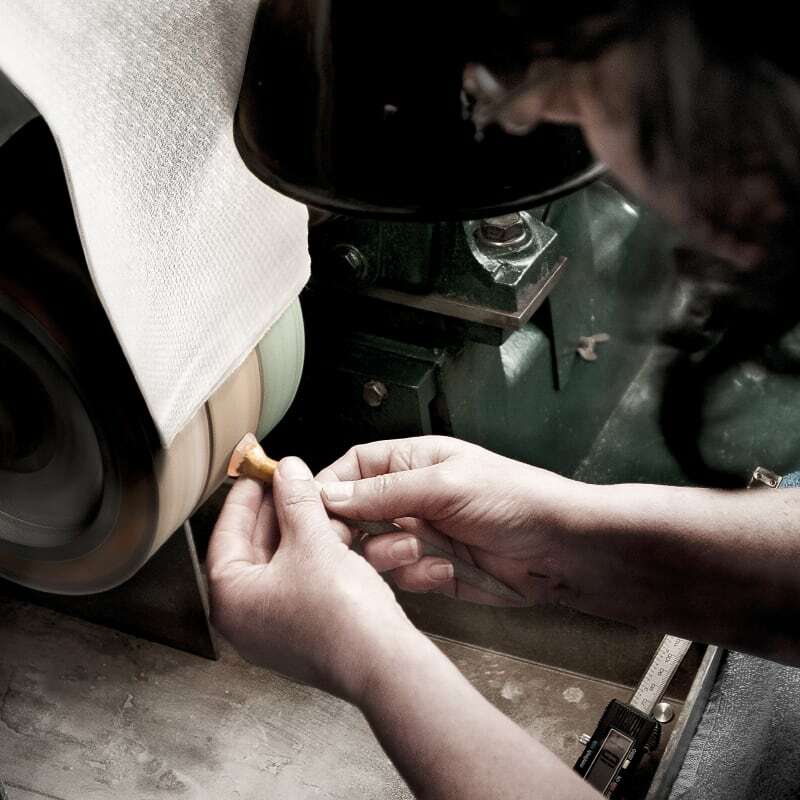 In traditional and professional craftsmanship, the delicate facets of the stone are now cut on different sides by the diamond grindstone. For this purpose, the putty rod is placed on a perforated board in order to guarantee a consistent angle and a steadily high precision of the cut. 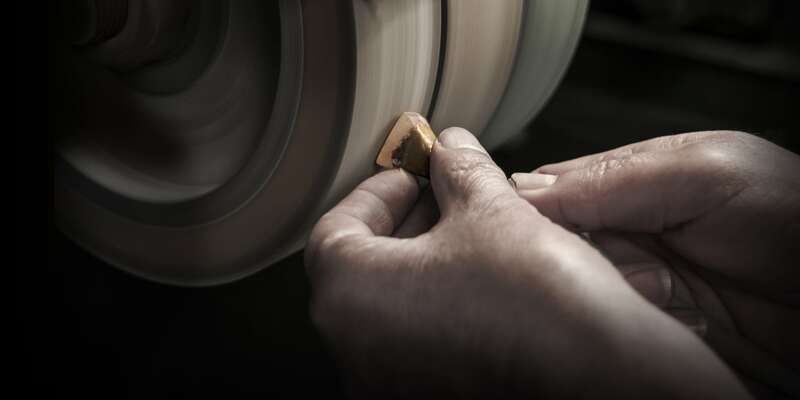 The facets of the stone are then polished to perfection. 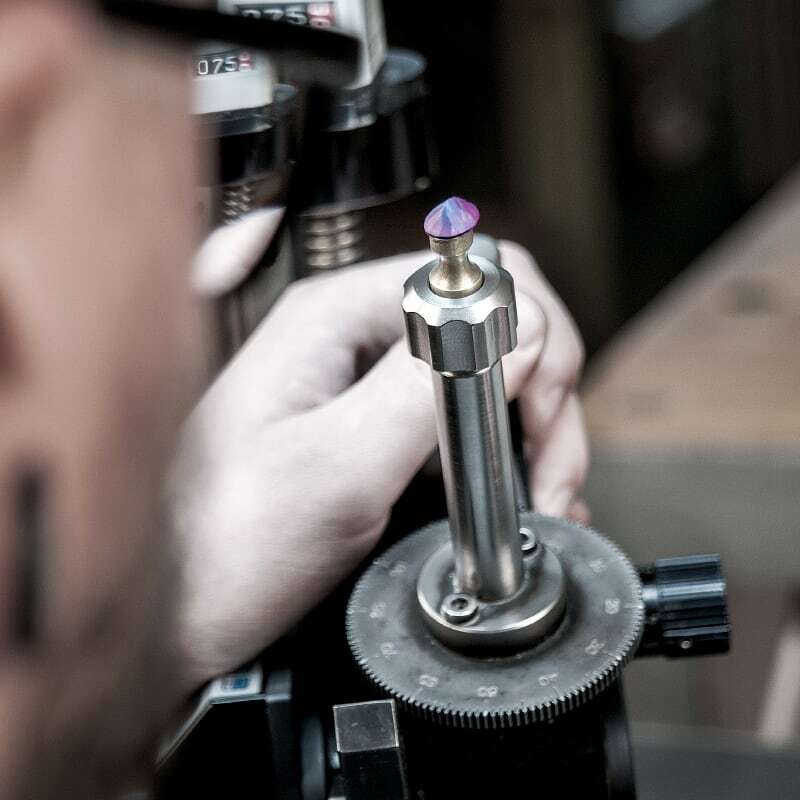 In order to prevent streaks, a very well-trained eye is needed in order to bring out the optimal splendour of the gemstone. 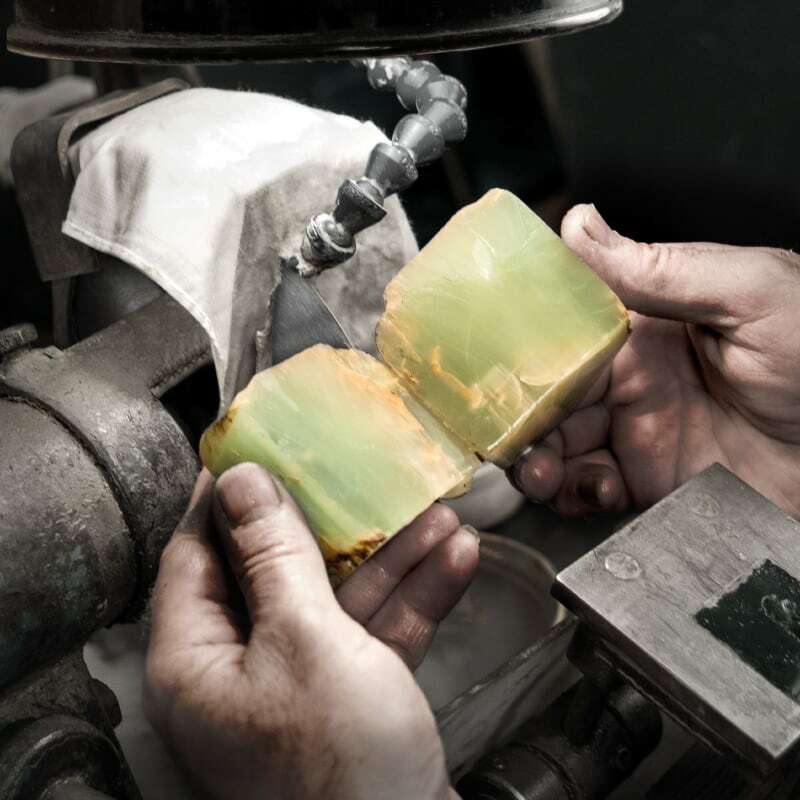 Finally, the gemstone is dissolved through the cooling of the putty and then put into an essence to remove the remaining putty residues. 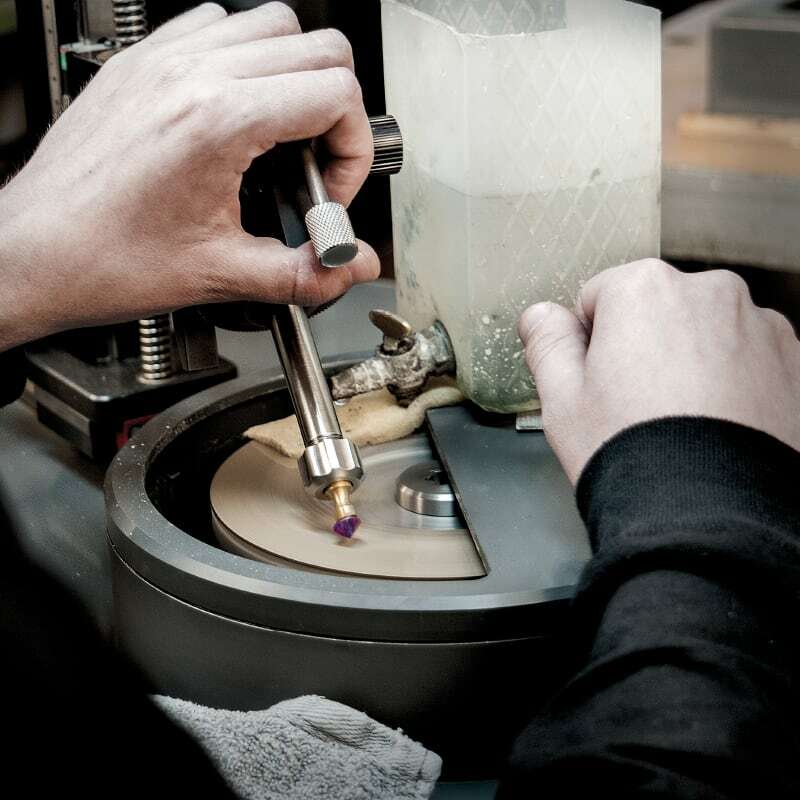 For serial productions that depend on the exact calibrated dimensions of the colour stones, the cutting process is carried out on the quadrant through the use of support technology. 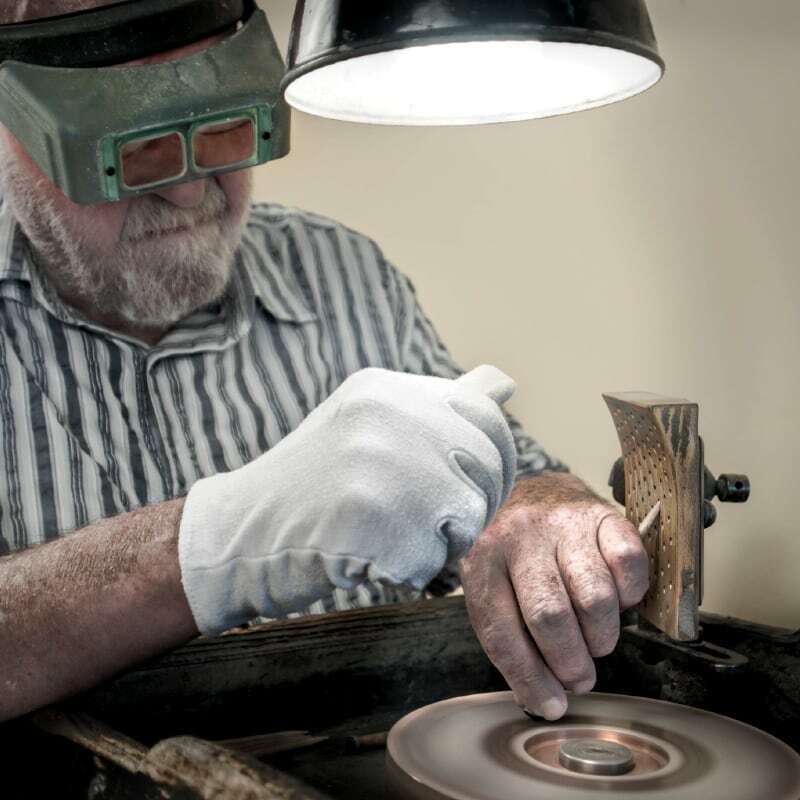 The traditional perforated board is replaced by a mechanical wheel on which the angle for cutting gemstones can be precisely adjusted with a digital display. Instead of the putty, a UV adhesive is applied which is fixed and hardened under UV light. In the cabochon cut, the gemstone is not engraved with facets, but rather cut into a round or oval shape, curved outwards. The cabochon cut, which is named after the French cabochon for “nail head”, is frequently used, for example, in opals or cat eye quartz, in order to bring out the natural shimmer of the stones in an optimal way.